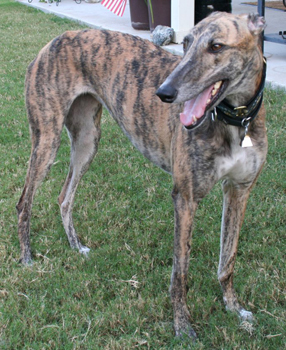 Pico, aka Kiowa Classmate, is one of 9 greyhounds GALT received from a Fort Worth Animal Control cruelty case. Most of Pico's fur is coming out in clumps, plus she has many scabs. 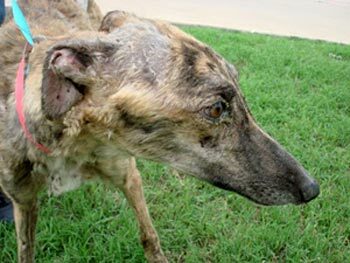 Just like the other rescued dogs, she is positive to babesia as well as ehrlichia at extremely high titers and has a huge load of intestinal parasites. She is being treated for all. 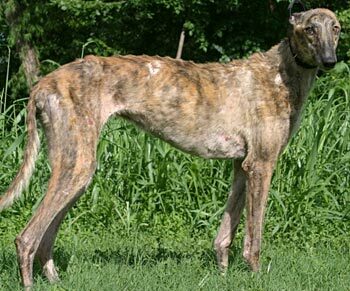 Pico is a 3-year-old brindle female born June 17, 2007. Her sire is Kiowa Sweet Trey, and her dam is Kay Quin Quantas. There are 10 races to her credit on Greyhound-Data.com, starting December 11, 2008, at Flager in Miami, FL, and ending there August 16, 2009. With all she has been through, this is one happy girl - her tail is always going! Pico is a voracious eater, so hopefully she'll put on weight quickly. She is a quick study, too, conquering the doggie door right away. Pico is cohabitating just fine with her foster siblings, including a smaller dog, but is not cat tolerant. 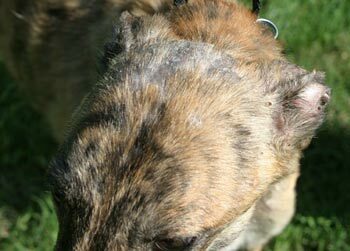 Pico's skin issues were greatly helped via the use of Vetericyn! 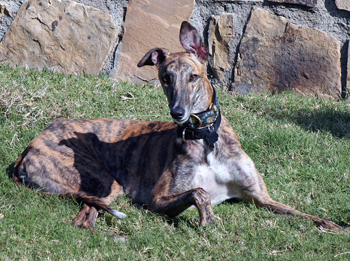 Pico was seen by Dr. Christy Soileau at Preston Park Animal Hospital last week for a check-up. 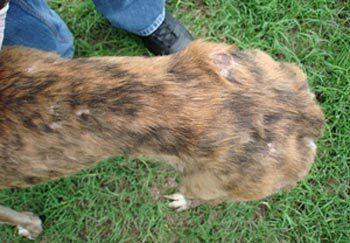 Dr. Soileau noted large areas of alopecia, scaling skin and numerous scabs. Pico is being treated with marbofloxacin and clindamycin due to upper respiratory infection-like symptoms as well as Doxycycline for 4 more weeks for ehrlichia. Pico is currently in a yo-yo pattern—one day she eats well, not so much the next day. This behavior seemed to be a precursor to the current conditions of Rachael and Martin, so she is being monitored closely by her experienced foster parent. If any downward changes arise, rest assured GALT will give her the necessary care to advance her recovery. 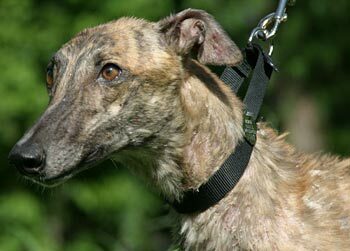 Pico’s coat is filling in nicely, and she continues to improve and get stronger each day with a healthy appetite. Because Pico was showing some weakness in her back end which could be caused by neurological effects, Dr. Jeff Ellis and Dr. Bob Radasch, after conferring with Dr. Doug Bronstad, recommended having a PCR test for distemper performed, based on her past and the cases of the other FWAC seizure dogs. Cerebrospinal fluid was collected and submitted. Test results came back today, and Pico is negative to distemper! Dr. Radasch is out of town until Tuesday, at which time he and Dr. Ellis want an update from the foster home. They will determine what course of action should be taken at that time. It definitely appears the medication she is on is helping. Based on the results of the PCR test being negative, the next step was taken to try to determine what is causing the weakness in Pico's back end. On September 15th, Dr. Bob Radasch had a CT Myelogram performed with the results showing no spinal lesions or disc problems on Pico. Cerebral spinal fluid was submitted for further diagnostic testing. These test results were received, and Pico was diagnosed by Dr. Doug Bronstad, in concert with Drs. Radasch and Ellis, with Meningitis Myelitis. She was started on steroids with the hope that we will see some positive responsive to the severe inflammation of her spinal cord. 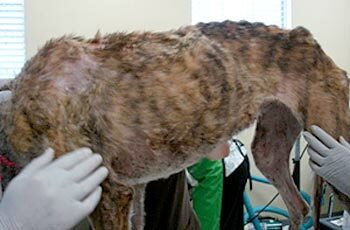 Even though she tested PCR negative to distemper, the doctors all feel that could still be a player in her condition. We will keep you informed. 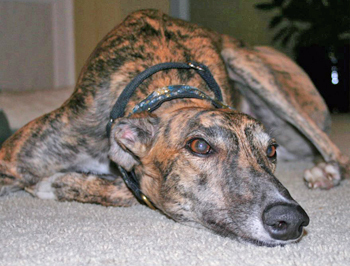 Pico continues to be under the care of Dr. Doug Bronstad for meningitis. Dr. Bronstad has added an antibiotic to her medical regime; Pico lost several pounds since her last visit. Efforts are being made to fatten this little girl up! Her energy level is exuberant. 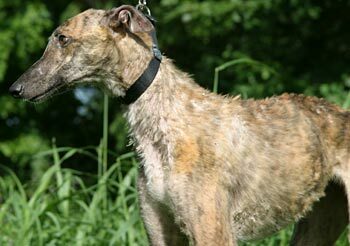 On October 12, Dr. Bronstad instucted us to start weaning Pico from the Prednisone. However within several days the symptoms (crookedness, difficulty getting up and panting) began to show up. Pico is back to her orignial prescription, and she is being checked by Dr. Bronstad weekly. 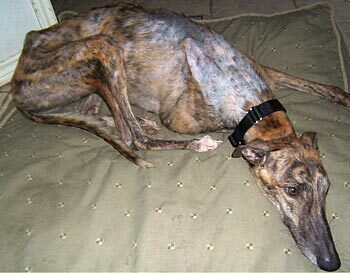 Pico is gaining weight under the love and care of her foster home! Pico continues to be monitored by Dr. Bronstad on a weekly basis. Her medicine is being adjusted, and Pico is responding well. Pico's medication is being alternated daily with prednisone one day followed by cyclosporine the next. She is doing well with this regime, and Dr. Bronstad wants to continue for the next two months. He feels Pico cannot be spayed during this time, as her immune system is compromised. 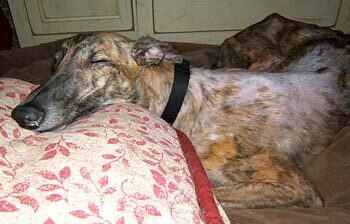 Since Pico has been feeling better, she's acting more like the three-year-old Greyhound that she is, so she came back to her original foster home to continue her recovery. She is enjoying three meals a day to help her put on some weight, as she dropped a couple pounds when the cold weather moved in. She is continuing her medication as prescribed by Dr. Bronstad. Pico remembered how to use the dog door, and will dash out with her foster siblings to chase any squirrels who foolishly run along the fence. She hasn't caught any yet, which is a relief to her foster mom. 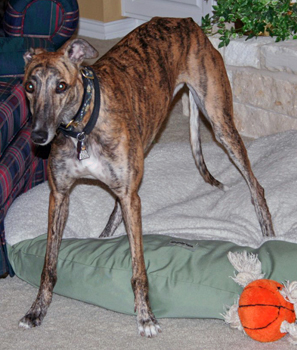 Pico remains a people-centered Greyhound. She is always the first hound to come for ear scritches or petting, and is never too far from her humans. She seems to be indiscriminate in her affection - she loves everybody who comes through the door! 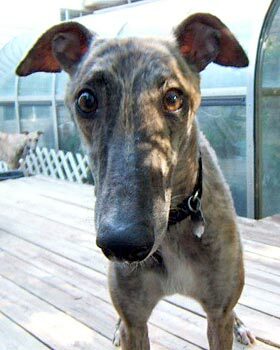 She'll pace a bit when you leave the house, and wag her whole body when you come home, but most of all she'll fill your heart and home with the joy of a Greyhound who has forgiven all the past hurt visited upon her.